I'm chugging along on a few things - the socks, the blue sweater, Soryu and they're all very fun and rewarding in their own ways, but there isn't enough progress on anything to make it worth taking a picture. Hopefully I'll have a skein of Soryu plied soon, and next week is spring break, so we may be playing with Kool Aid but for now . . . .
Oh, here comes our silly, yowl-y, must-be-let-out-because-it's-2:38am kitty cat, Sneaky. Sorry for the lame picture - it's sort of hard to take a decent picture of a sock in process . . .
Don't know how well the yarn will wear, but I like the feel. Nice and soft, a little springy, not splitty. 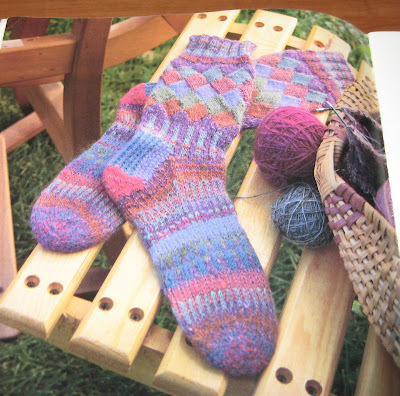 Pattern is very nice, I've simplified it a bit, mainly because I hate to knit socks . . . . Or I used to. The Mad Crocheter is right. Magic needles rock. I've always gritted my teeth through socks, gloves and mittens because a.) I hate to have to make things that match b.) double pointed needles kind of stink (especially small gauge ones, they shred my finger tips). Hating them makes them slow work, more hate piles on, it gets ugly. This is 1 day's worth of knitting. I think I might like socks again. I really love my husband. A lot. He's smart, funny, good looking, a great dad . . .
And the man has really lousy luck finding socks that don't fall apart on him in about 2.75 weeks. So, I'm going to try some Knitpicks Risata Sock Yarn to make him some socks. I'm going to try Ash and Dusk (nice and neutral, work appropriate). I found this promising pattern on Ravelry (I've used a direct link to her blog so non-Ravelry users can see it too). I figure the cotton should make them not horribly hot, and they can be machine washed - which is a very good thing for stuff you put on your feet. You'll have to open these to get a sense of the colors coming together. I'm working to make it very thin and put a lot of twist into it, because I've never been very happy with my own plying attempts. I'm pulling tiny amounts of 2-4 of the rovings and spinning them together so I can get some nice striation. I'm making sure there's continuity between each of the sections - one or more color has to "bridge" to the next selection of colors. It's supposedly random, though we all know nothing humans do is, so I'll be sort of interested to see how it comes out when plied. It really cuts down on the glare of the sun on the screens of one's DS while playing Sonic. And yes, I did have to spend about 10 minutes getting the stitches back on the needles, but hey, this is a totally legitimate use of knitting in my book. (He also snuggles up under it when he's cold). Sorry, nothing very interesting yet . . . I really need to take a picture of this puppy out on the porch, in daylight. I'm 2 inches away from splitting for the armholes, and then the sleeves are st. st. except for a border detail around the cuffs. It's such a nice, mid-range intensity pattern and I love the color. Almost done with this batch of spinning (like I should finish tonight). Spinning for me goes with baseball season, but I've already run through 3 lb. of fleece since the new year. Perhaps my blue dragon will keep me company this year. If that doesn't hold me, there's also Akai Ryu - red dragon. I could spin a red dragon . . . . So you don't want all those pastels, eh? How about this? Use onions and beets, or just food coloring? I like the idea of being about to do some browns, maybe make some nice low key entralac socks, and to supplement Kool-Aid's lack of strong blues . . . There are many places that will tell you how dye fiber with Kool Aid, but I have to admit this one appeals most. It has nice pictures! Knitty has a nice entry on this as well. And so but, I'm thinking about spring break. The little one is very into color theory and playing with grown up stuff, so maybe dying some small batches in many colors and making socks out of it would be fun. which would be . . . . not getting much done. "Andre creep, Andre creep, Andre creep . . ."
But here they are. Got one skein of the wine Ashland spun, here's half a skein of patina. Pretty, but slow. All of it. 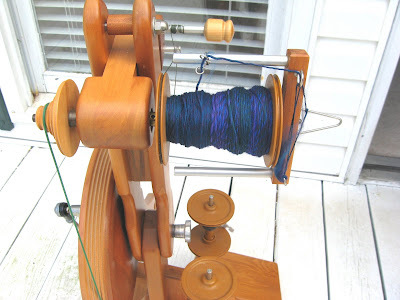 Think I might have changed the idea for my spinning from a peacock to a blue dragon - call it Soryu (Japanese for blue or green dragon, I think). Sandalwood and Rose Quartz now have friends - meet Wine and Patina. I think Patina will work perfectly, Wine might be a bit dark, hopefully it won't make Rose Quartz look washed out. Yay! More spinning once I get done with working out. If you have ever met, and heard, real live peacocks, you know you do not want me to actually spin an actual peacock. However, I want to spin something like one. What do you think of these colors? (And yes, I finished the last of the rose quartz last night - it's setting in the bathroom right now, yucky smell, lovely yarn!) 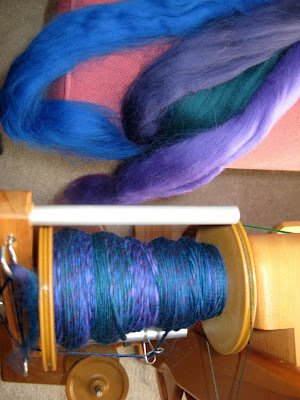 Imagine these spun up in sections, randomly, then plied together. Or maybe divide the colors into families and ply the purple blues against the green blues? Does it need a true green as well? I've found a pattern on Ravelry which was a dead link. So I didn't stash it. And now I can't find it again. But maybe I'll do these instead. God, her work is lovely. 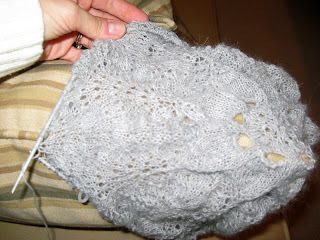 My slow slow lace is this - maybe I should try it in a larger gauge. Okay, remember the Harry Potter sweater? I ripped it out. I liked the pattern, but it wasn't quite right and that would have been too much of a very bright blue on the little one. Plus, as the husband points out - he won't be able to wear it for months and it doesn't make sense to do anything too early, since he grows like a weed. I'll think about it and see what appeals in the fall, I think. 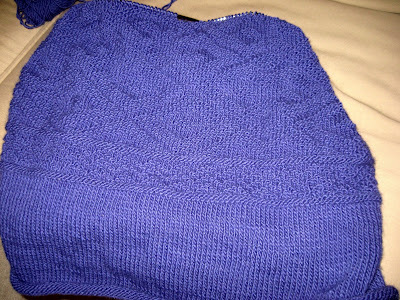 In the meantime, I've started one of my favorite sweaters for the 4th time. It's the Barnyard Guernsey (pg. 45 in Knitting the New Classics by Kristin Nicholas, ISBN 0806931701) in Lamb's Pride Worsted sapphire. The first time I made one in blue blood red and one in charcoal. I gave both away when we moved south. Then I made one for my mom in medieval red a couple years ago. Now I want it in this lovely indigo-blue color. This time around I'm not making a front and back, I'm doing it in the round. Which is inspiring me to work continental, rather than throwing. 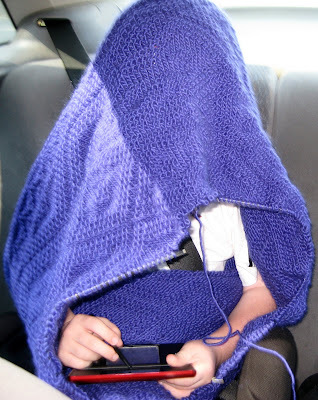 I think this is largely in sympathy with the beleaguered Mad Crocheter. She's been laboring to learn to knit and I've been somewhat inexpertly teaching her Continental knitting, so I guess I'm trying to brush up so I can do a better job. I learned to knit (throwing style) at 4 from my grandmother (red acrylic place mats on size 10 wooden needles that had dog tooth marks in them, lord it took me months and I made 4 of the horrible things) and then learned continental in high school. It was mainly a learning exercise; I've never been truly ambidextrous (ambitechnic? ), but I'd like to be. And, even though I'm pretty fast when I throw (and for Fassett color work would never switch), you just can't argue with the speed of continental when you work in the round. Especially on a knit and purl pattern, which is what this is.